E. Special Effect - Any Special Effects that the card offers. 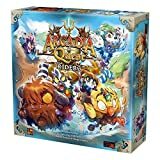 F. Code - Use this identifying code to easily log your cards in the Campaign Sheet. Attack cards are what allows a Hero to make an attack against an Enemy. 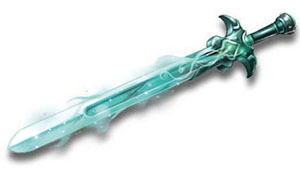 A Hero with no Attack cards in his inventory is generally incapable of executing an attack when activated. But if he has multiple Attack cards, he can still only use a single one per attack. However, since when an Attack card is used it must be exhausted (place a Guild token on it), having multiple Attack cards available to a single Hero gives him not only more options, but the ability to attack for multiple turns before needing to Rest and unexhaust his cards. 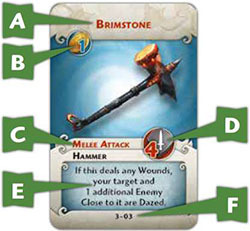 All Attack cards are able to make either Melee or Ranged attacks, as indicated by the icons of their listed attack dice. While some Attack cards offer only a simple attack, many have some form of special effect listed which enhances their attack. This effect is only triggered when the card is used and the parameters stated in it are met. Boost cards are companions to Attack cards. While they can never be used on their own, they might be able to greatly improve the power of an Attack card being used. When a Hero is declaring his attack (before rolling the Attack dice), he may choose to also use one or more Boost cards in his possession. He exhausts the Attack card being used, and also exhausts any Boost cards being used in conjunction (place a Guild token on it). The special effects offered by the Boost card are then added to the attack being executed. Note that some Boost cards only work with specific types of Attack cards, as described in their text. As is the case with Attack cards, an exhausted Boost card cannot be used again until it is unexhausted. Permanent cards work exactly like the Heroes' Natural Ability. They give the Hero that possesses them a special ability that is always in effect, according to the parameters of the card's text. Permanent cards are never exhausted, so their ability is always at the disposal of the Hero who has it in his inventory. If a Hero decides to use a Permanent card's effect on an attack, he must declare it before rolling any dice. Defense his cards might grant him. Extra Defense is always add- ed to the Hero's Defense, even if the card that contains it is exhausted. Cards with this Extra Life icon grant the Hero who owns them the ability to sustain more Wounds before being killed. Add together the Hero's basic Life and any Extra Life his cards might grant him. It doesn't matter whether the card is exhausted or not. This is his total Life: the number of Wounds necessary to kill him. Cards with this Reroll icon allow the Hero who owns them to reroll the indicated number of dice after his dice pool has been rolled. The result of this new roll replaces the original result. All of a Hero's cards with Reroll icons always add to his Reroll pool, whether they are exhausted or not. Whenever a Hero makes a roll (be it an Attack or a Defense roll) he has his full Reroll pool at his disposal to use in any order he'd like. Some attacks are able to daze their target, leaving him open to future attacks. When a Character is dazed, lay its figure on its side to indicate his condition. A dazed Character is not allowed to roll any Defense dice against attacks. Other than that, he may act normally, moving and attacking as usual. When a dazed Hero Rests he recovers from the daze effect. Place his figure back up to indicate that. Bombs can be extremely dangerous, which is why each Guild can only possess a single Bomb card at a time. When a Bomb card is used, resolve the attack normally against the targeted Character. If the Attack roll scores any hits, it creates an incendiary minefield around it. Place one Guild token in the target's Space and in all Spaces Close to it. If an Enemy Hero enters a Space with one of these tokens, he suffers an attack like the original Bomb attack (though any Abilities or Rerolls don't apply to this attack) and that Guild token is removed from the board. If that Hero is killed, credit goes to the Guild whose token exploded, though any Exploration tokens that the victim carried must be placed on its Space. If a Hero enters a Space containing his own Guild's token, nothing happens. If a Hero enters a Space containing multiple Enemy Guild tokens, they all explode simultaneously. Add the dice for all Bombs involved into a single attack. If a Hero is killed in such a simultaneous attack, all Guilds involved in the attack get the credit for the kill. 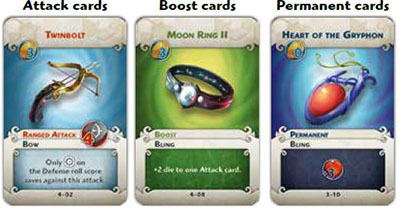 Some Upgrade cards require that the player "exhaust the Hero" in order to use a special effect offered by the card. To exhaust the Hero using the card, simply place a Guild token on top of his Hero card. That Hero's card is now exhausted, and so he won't be able to use any other special effects that need to "exhaust the Hero" in order to work until his Hero card is unexhausted. The Hero card can be unexhausted by using a turn to Rest and remove all Guild tokens from the Guild's cards. A Hero with an exhausted Hero card does not suffer any penalty. He can be activated normally, moving and attacking as usual. He is just unable to activate special effects that require him to exhaust his Hero card. He can still use his natural ability (as long as it doesn't require him to exhaust his Hero card). Some abilities require the active Hero to suffer a number of Wounds in order to use them. The Hero must take the required number of Wounds before rolling any dice for the ability. However, a Hero cannot use such an ability if the Wounds taken would cause him to die. If he doesn't have enough Life left, he cannot activate the ability.